Because there really is no right way! This is the tried-and-true method that many of us have sworn by since we were kids. Considering halo-halo translates directly to “mix-mix” this way really is how you can have the purest halo-halo experience ever. From the bright yellow beans to the lovely macapuno to the silky leche flan to the yummy ube to so many more pretty goodies, halo-halo is certainly what we'd call a lovely dessert. It’s no wonder people delight in savoring this treat piece by tasty piece! If you’re not a fan of shaved ice, then a great way to enjoy halo-halo is to wait until the ice melts into the milk, creating a perfect base for that curiously rich mix of fruits, sweetened beans, and dessert bits. 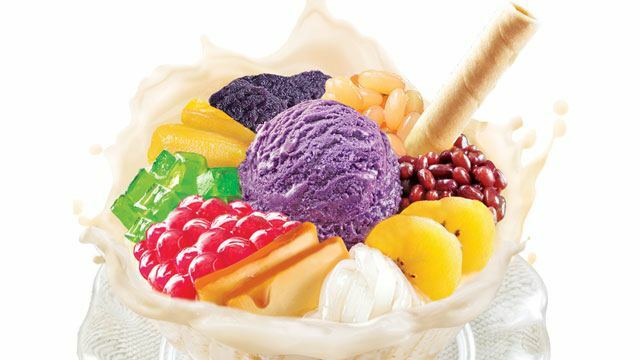 One of our favorite things about halo-halo is that each bite bursts with a variety of flavor and texture, with every ingredient working together to make the perfect dessert. Then when you’re finished with all the toppings, nothing’s better than washing it down with the milk mixed in with the melted ice! This one is for those who don’t want to commit to a full glass of deliciously mushy halo-halo: start off with eating the top pieces individually, then when your glass is half-empty, mix the remaining ice and ingredients together. There’s really no wrong style or method when it comes to halo-halo. From the ingredients you use, to the way it’s prepared, to how you eat it — it’s all up to your eating pleasure! So make sure you don’t miss the chance to enjoy halo-halo every way your heart desires at any Mang Inasal branch nationwide. Now that's one way to enjoy this famous Filipino dessert! we can all agree on! This article was created by Summit Storylabs in partnership with Mang Inasal.